Are you looking for an application that can easily and reliably convert FLV files to MP4 format? WinX Free FLV to MP4 Converter will be useful for this purpose. In Apple iOS devices like iPad Air2, native flash support is not available. So, to view your favorite YouTube videos, you need to convert from FLV to a iPad or iPhone supported video format which can convert HD content also losslessly. There are applications available that are easy to use even for amateur users. I'm pleased to give you a brief explanation of converting FLV to MP4 for iPad Air2 playback. As an Adobe file format, FLV is generally referred to as "Flash Video" containing synchronized audio and video streams. FLV is the standard for web-based video format owing to smaller size and better loading performance, which is widely used by YouTube, Yahoo! Video, VEVO these notable portals, just name a few. Though FLV video on YouTube is online viewable on your PC via Adobe Flash Player and web browser plug-in, Apple's iOS devices still don't support the Flash Player plug-in and can't play FLV videos, even terminal gadget like iPad Air2. Sure; converting FLV to MP4 is the way to go if you posses a FLV video and iPad Air2/Mini 3, iPhone6/6 Plus etc. 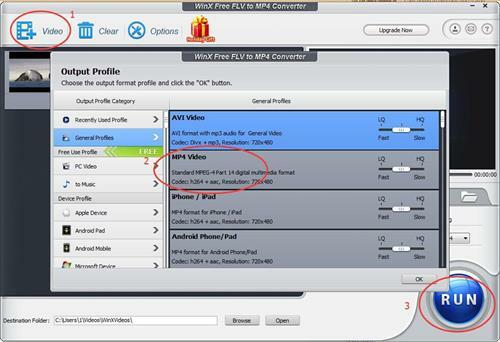 So without further ado, I'd like to recommend easy-to-use freeware WinX Free FLV to MP4 Converter to solve FLV to MP4 cross-format conversion problem and put an end to Apple device owners' regret for FLV video playback. Now I'll walk you through only three steps of converting FLV to MP4 quickly and faultlessly. Step 3. Hit the Run button and start converting FLV to MP4. This free video converter with intuitive interface enables you to enjoy the MP4 video losslessly on any device converted from FLV in just few clicks. Besides, this FLV to MP4 video converter freeware offers you easy-to-advanced editing features to customize your video style. It allows you to flexibly adjust parameters/crop/trim/merge your video and even to add subtitles. I know that the world of video formats can be de facto in a state of puzzling, but you are entitled to upgrade to full version - professional video troubleshooting utility WinX HD Video Converter Deluxe. So if you are fed up with being entangled by sundry confusing format conversion problem, such as MOD to MOV, AVCHD to AVI, MKV to MP4, VOB to RMVB, MP3 to ALAC etc, compatible with your up-to-date portable devices, I have to say, let WinX HD Video Converter Deluxe give you an ultimate control over SD, HD and 4K resolution video files with over 370 video & audio codecs. Here are top reasons why I greatly recommend this killer video conversion software to you. 5. Trim, Crop, Merge video and add *.srt subtitle to your downloaded videos with ease. On top of all that, with fast, well-designed, and be capable of converting any video format you throw at it, this powerful video converter is actually worth a thousand video conversion tips I wrote here. So why not to have a try with WinX HD Video Converter Deluxe? You may also use iDealshare VideoGo which can batch convert FLV to MP4, MOV, AVI, WMV, 3GP, MPG etc on Mac or Windows. I used this http://www.techulator.com/resources/ViewResourceDetails.aspx?resourceId=13663 mp4 compressor to convert my videof from flv to mp4. it is fast but not enough, what the difference betwwen it and winx may you tell me.